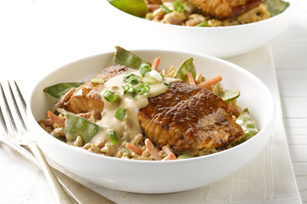 Delicious teriyaki salmon fillets top a creamy vegetable rice in this dish - ready in just 30 minutes! Heat oil in large nonstick skillet on medium-high heat. Add fish; cook 2 to 3 min. on each side or until fish flakes easily with fork. Remove fish from skillet; cover to keep warm. Add snow peas, carrots, 1 Tbsp. teriyaki sauce and garlic to skillet; cook and stir 1 to 2 min. or until vegetables are crisp-tender. Add cream cheese product, broth, milk and remaining teriyaki sauce; cook and stir 2 to 3 min. or until cream cheese is completely melted and sauce is heated through. Remove from heat. Reserve 1/4 cup sauce; cover to keep warm. Add rice to remaining sauce in skillet; mix well. Spoon rice mixture onto platter; top with fish, reserved sauce and onions. Garnish with 2 Tbsp. toasted sesame seed or sliced almonds before serving.